The Short Version: Hilton Head Island, voted the #1 Island in Travel + Leisure’s World’s Best Awards 2018, offers over 12 miles of gorgeous beaches perfectly suited for long romantic walks. Bask in the sun and surf as lazy days on the beach turn into relaxing nights under endlessly starry skies. 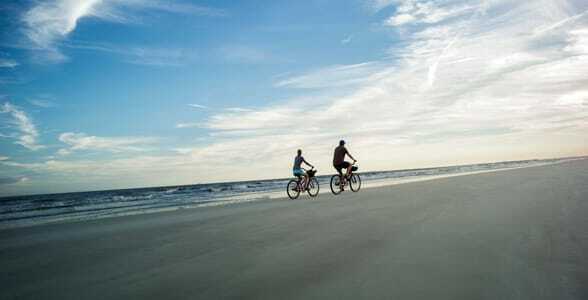 With 33 world-class golf courses, 350 tennis courts, and 200 restaurants, Hilton Head Island is a gorgeous place to unwind and reconnect with your partner. You can deepen your bond with a signature experience and create memories that last a lifetime. Visit a gallery, catch a theatrical show, or enjoy a historical lecture to round out your visit. And don’t worry — if you didn’t get to do it all, you can come back anytime. When a meditation leader invites people to find the calm places within them during a relaxation exercise, they usually imagine a beach, an ocean view, a quiet day in the sun. Such a peaceful image relaxes the mind and the body. Blood pressure lowers and breathing slows as people escape from their everyday stresses. Tropical islands are especially coveted getaway locations because they feel remote and intimate. Stealing away for a long weekend on an island with your significant other is a common daydream. Couples can reconnect by taking a break from stress and routine in a place that restores the mind and body. 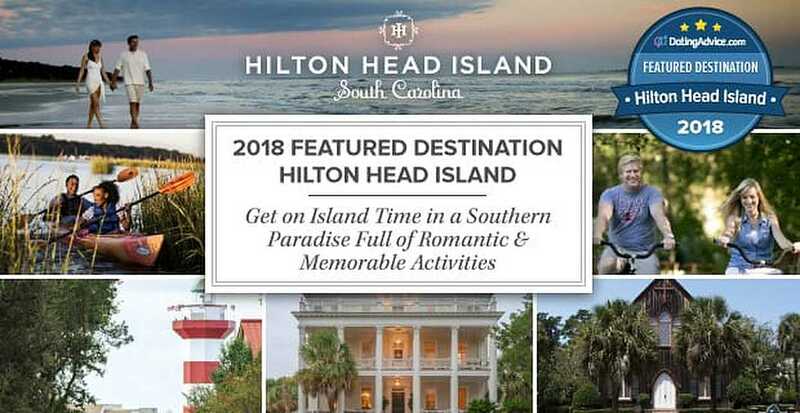 Located in South Carolina, Hilton Head Island is a world-class destination to escape to with your sweetie. American couples don’t have to leave the country to explore the sandy beaches and sparkling waters — they can book a luxury stay at Hilton Head and leave their passports at home! Hilton Head Island invites out-of-towners to experience Lowcountry life in a quiet setting, absent of garish colors and harsh streetlights. You and your significant other can take in the surf, sand, and sun, letting the natural surroundings calm you and provide a beautiful backdrop for your intimate moments. Even though Hilton Head Island is on island time, it still offers visitors plenty of excitement and activities. Whether you’re interested in lazing on the beach, sailing, golfing, or shopping, there is always something to do or experience here. Hilton Head plays cupid for many a couple. You can hold hands with your favorite beach bum and take a stroll through the surf or enjoy a seafood dinner under the moonlight. Such unique vacation opportunities can strengthen your connection to your loved one. Charlie gave us some excellent recommendations for couples visiting the island for a weekend or an extended stay. “There are few things more romantic than an island,” he said. “Date options run the gamut from horseback riding through the 600-acre Sea Pines Forest Preserve to rooftop drinks overlooking the Atlantic at the Ocean Lounge at the Sea Pines Beach Club.” Charlie told us you can spend the day stand-up paddleboarding or kayaking on the water or lounging on the beach with a personal beach butler fetching cocktails and snacks. You can even make a fun wager with your date to see who can shuck oysters the fastest. Hilton Head Island also has traditional dinner-and-a-movie date options — with an island twist. Finally, don’t forget Hilton Head Island boasts 12 miles of beach, and what could be more romantic than a walk on the beach at sunset? Imagine you and your lover walking side by side along quiet sandy beaches as the sun sinks into the horizon. Now that’s a romantic backdrop! If you want to immerse yourself in Lowcountry living, choose a Signature Experience, which offers an unforgettable adventure in Hilton Head. Choose from an assortment of activities, tours, performances, and demonstrations that connect with the island and its people. 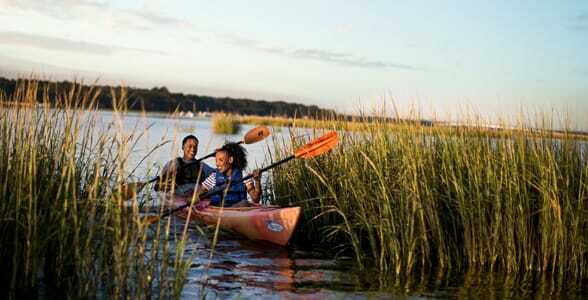 History buffs will enjoy delving into the life of Harriet Tubman or discovering the Gullah people and their community. Then you can go back in time with the Old Town Bluffton Walking Tour to learn about the history, culture, and architecture of the area. This educational afternoon activity includes a guided tour of an antebellum home. 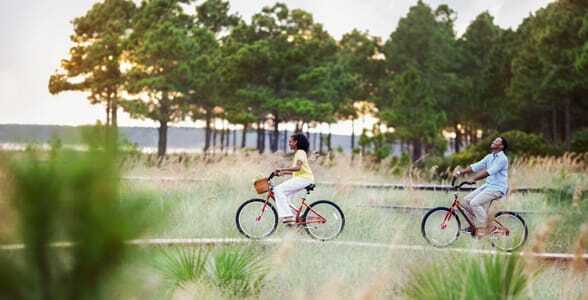 Active couples will delight in biking on Hilton Head Island. Head out to Historic Mitchelville Freedom Park, a remote area with a maritime forest, salt marsh, beach, and boardwalk. At low tide, join other explorers as they search for clams, fish, and shells. Plus, four other Hidden Bike Routes also entertain outdoorsy couples who enjoy biking around town! The Art of Mixology experience at Bomboras Grille and Art Cafe is ideal for spirited twosomes. Attendees learn to make four signature cocktails while enjoying delicious appetizers. Once the class is over, you can get creative by painting your very own cocktail glass, which you can take home as a souvenir. Signature Experiences give visitors an opportunity to connect with one another, the culture in Hilton Head, and the community. It’s also a great way to soak up the area’s famed Southern hospitality. Hilton Head Island offers visitors a thriving arts and culture scene that includes theater, morning history programs, jazz performances, and music festivals. Check the Arts and Cultural Council of Hilton Head for event schedules. Hilton Head Island is known for its golf courses too. Treat your favorite golfer to 18 holes on one of Hilton Head’s public or private golf courses designed by celebrated architects, retired professional golfer Jack Nicklaus. Each course on Hilton Head sports unique characteristics to keep even the most seasoned player challenged. If your swing is more Happy Gilmore than Phil Mickelson, many of the courses have highly regarded golf schools to help you refine your skill.